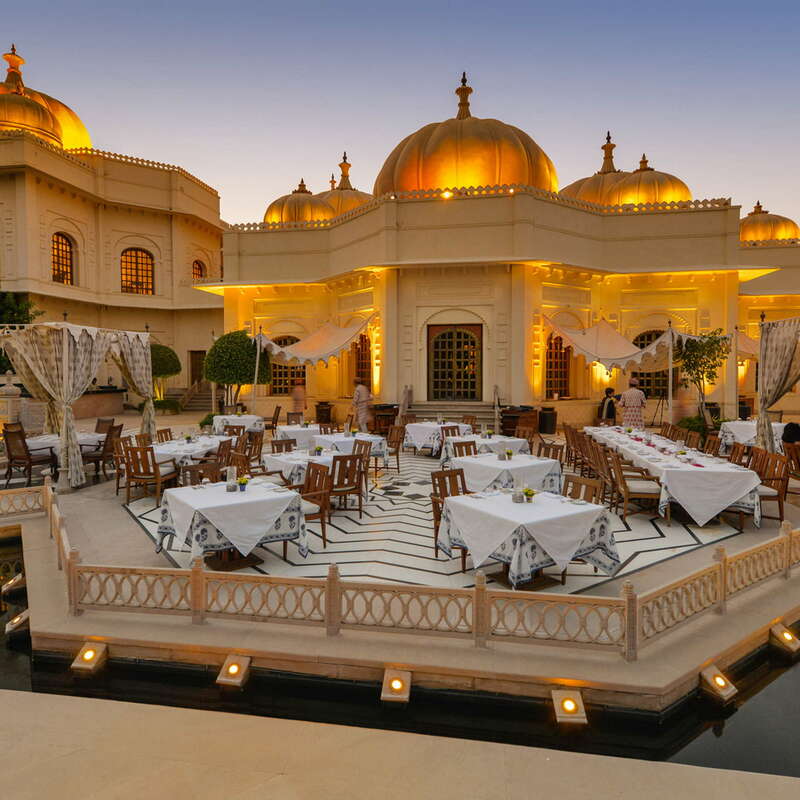 One of India’s (and possibly the world’s) finest hotels, The Oberoi Udaivilas offers unparalleled service and luxury on the shores of picturesque Lake Pichola. It’s a palace of a hotel, set on 30 perfectly manicured acres covered in fountains, infinity pools, and stunning architectural details. The hotel staff might be the highlight here, with thoughtful and friendly (not to mention beautifully dressed) employees committed to delivering the best possible experience for guests. 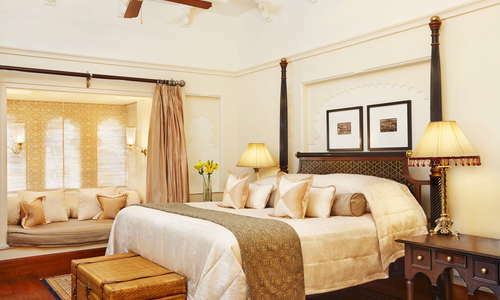 With sumptuously comfortable rooms, an extensive spa, and world-class dining, guests may find it hard to leave. 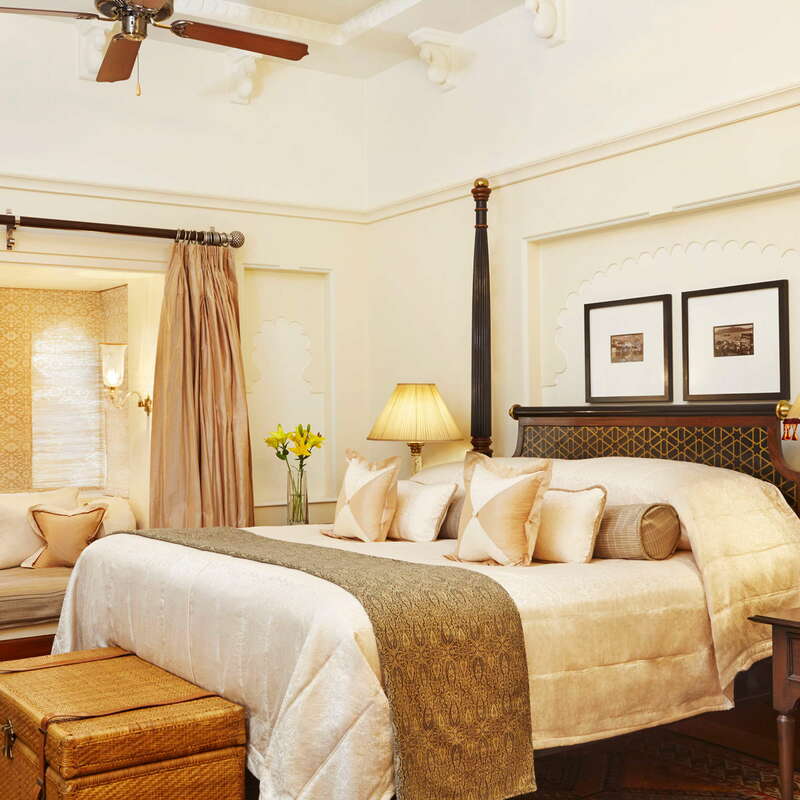 Even the most basic rooms here are impeccably decorated with antiques and colorful, locally-made fabrics. Nothing here feels mass-produced and all the furniture feels unique and thoughtful, like the kind of furniture you’d find in the home of a spectacularly wealthy foreign dignitary. 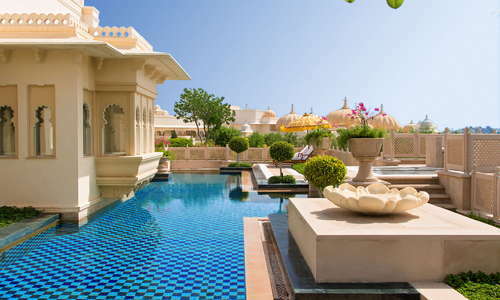 The more expensive suites have private access from the back doors to an infinity pool, and the over-the-top Kohinoor suite has a private pool. 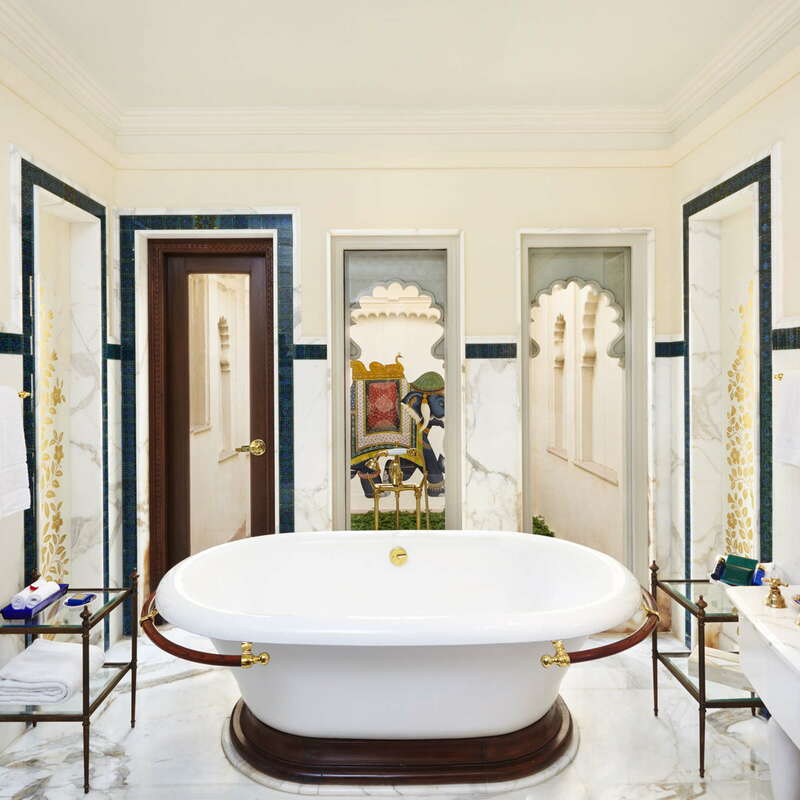 The bathrooms have showers and luxurious clawfoot tubs and the complimentary bath products are from Forest Essentials, an ayurvedic beauty company. The products are made with local ingredients and are worth bringing home--either in free sample form hoarded from your hotel room or purchased in the spa. 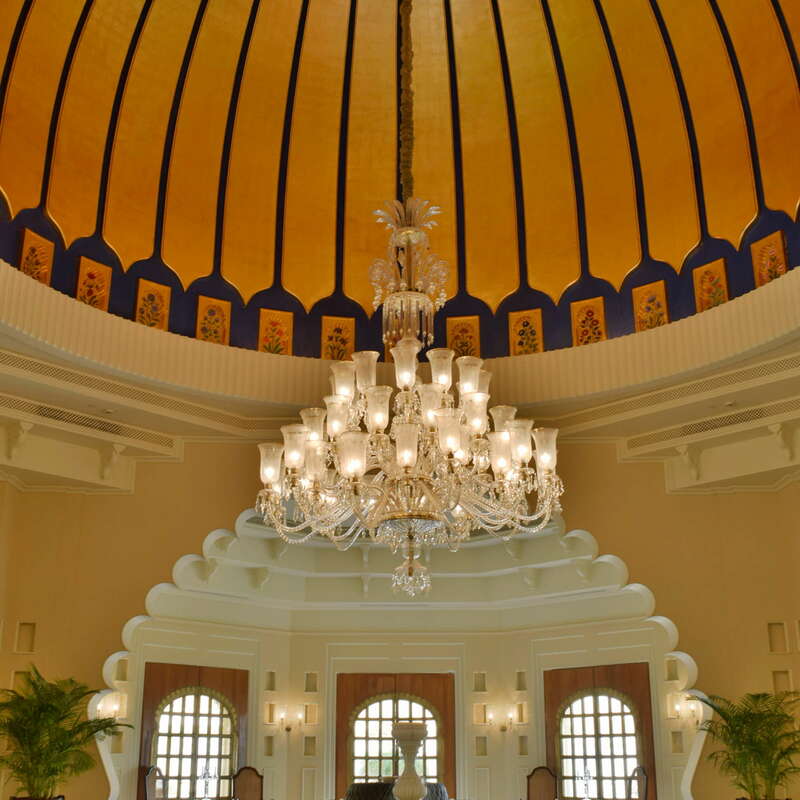 Guests first enter the property from a front courtyard which leads to the lobby, where there’s a giant gold and royal blue dome. 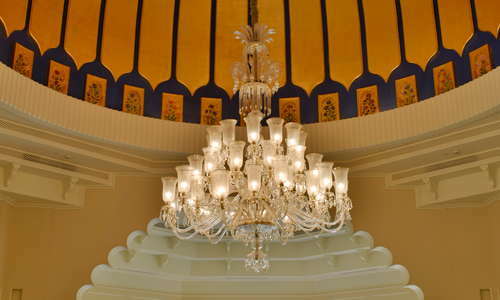 There’s comfortable velvet furniture thoughtfully placed throughout the lobby and an ornate fountain in the middle of the room, under the dome. There are two main pools on the property, plus a private infinity pool that connects all the pool suites. 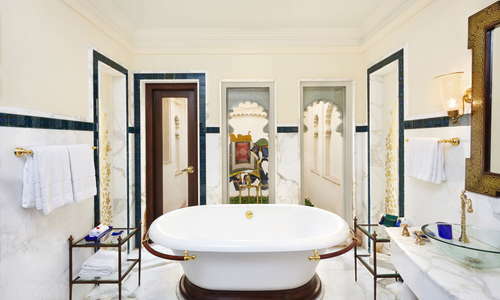 The Kohinoor suites all have a private pool. 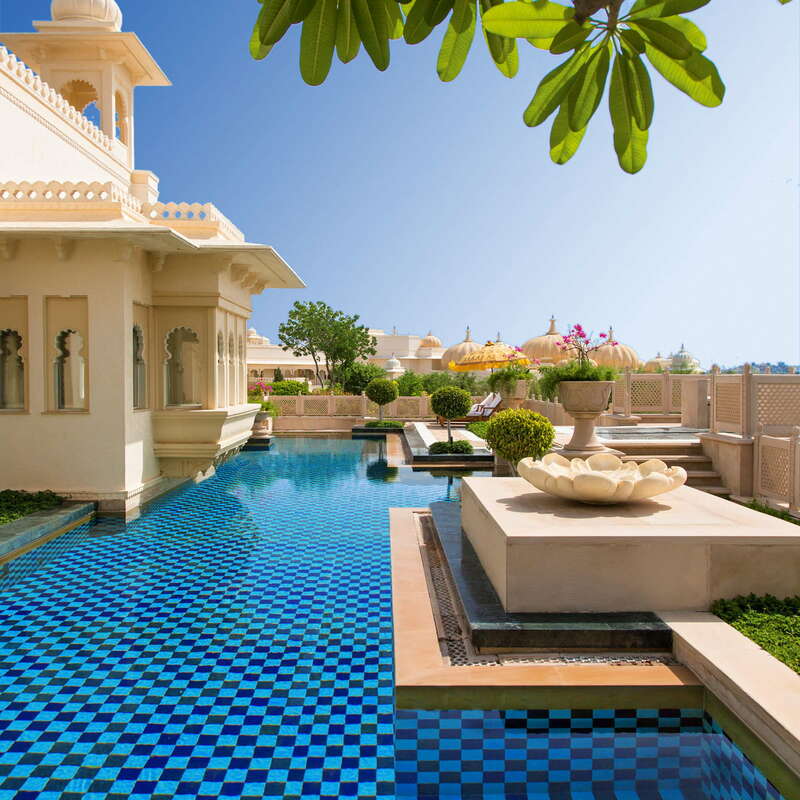 The Oberoi Udaivilas Spa is world-class, offering traditional ayurvedic treatments, as well as more familiar Western massages, facials, and treatments. There’s also yoga offered daily on a platform overlooking glassy Lake Pichola. Don’t forget to look up when you’re visiting the spa--the mural on the dome is one of the prettiest artworks on the property. Meals here include a huge wealth of options ranging from local Rajasthani cuisine to other South Asian options and international favorites. The extensive breakfast buffet is not-to-be-missed, with options ranging from delicate French pastries to South Indian Thalis to hearty British and American breakfast staples. Guests should plan on at least one dinner here, which is a candlelit affair under the stars with live music, delicious food, inventive cocktails, and an impressive wine list. The hotel is located across the lake from Udaipur’s City Palace and the town of Udaipur, and can provide transportation from the airport and to town--so, there’s no need to rent a car while staying here. Airport transfers to the hotel include a lovely boat ride across Lake Pichola. Maxim's (10-minute drive) serves international vegetarian cuisine (including Indian specialties) on a rooftop with views of Jagdish Temple. 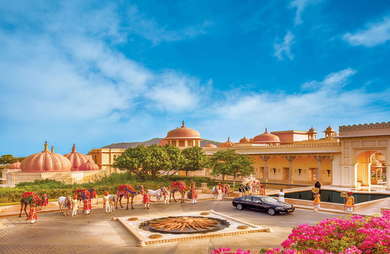 Jagat Niwas Palace Terrace Restaurant (11-minute drive) has spectacular views of the City Palace. The menu includes Indian, Asian, and Continental cuisine and there's live music during peak season. 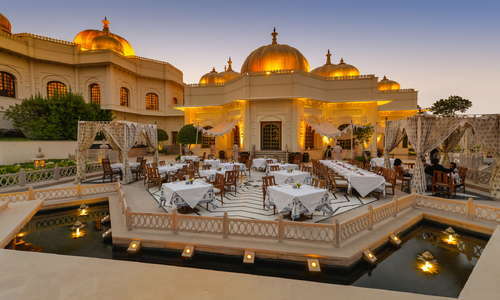 There's not much nightlife in Udaipur, but there are a number of cafes in town including Cafe Namaste and Rainbow Restaurant (8-minute drive). 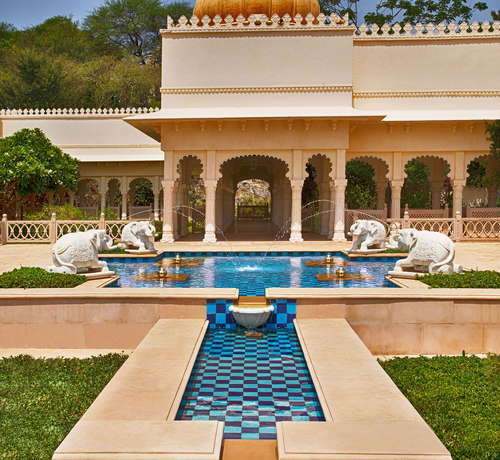 This hotel is like a real-life fantasy of an Indian palace. The location, design, food, and service are beyond comparison. It’s expensive, but it’s worth every penny.